There’s a Joseph Gordon-Levitt movie called Premium Rush that’s all about bike messengers weaving through the traffic in New York City. The main character visualizes all the wrong approaches and simulates several awful crashes before finally landing on the right angle of attack, which he then executes perfectly. It’s that kind of keen spatial projection that will get you through each level of Does Not Commute. This is a game about driving and finding small moments of beauty in all of the chaos, like when you skid perfectly between two incoming cars and reach your destination without a scratch. You drive one car at a time from point A to point B, and once you arrive at your goal, you’ll take the role of a different car somewhere else on the level. Once you’ve finished a few runs, you’ll realize that all of the cars you’ve previously driven are now whizzing by you. You’ll suddenly rue your reckless driving from only 30 seconds earlier as past versions of yourself make it hell for you to skid around a corner in one piece. If that sounds chaotic, that’s because it is, but the “crashendo” builds so slowly that you’ll always understand just enough to navigate your way through it all. Add a countdown timer for each level and a set of tantalizingly placed timer refills around the map, and you have yourself a recipe for some nail-biting vehicular puzzles. 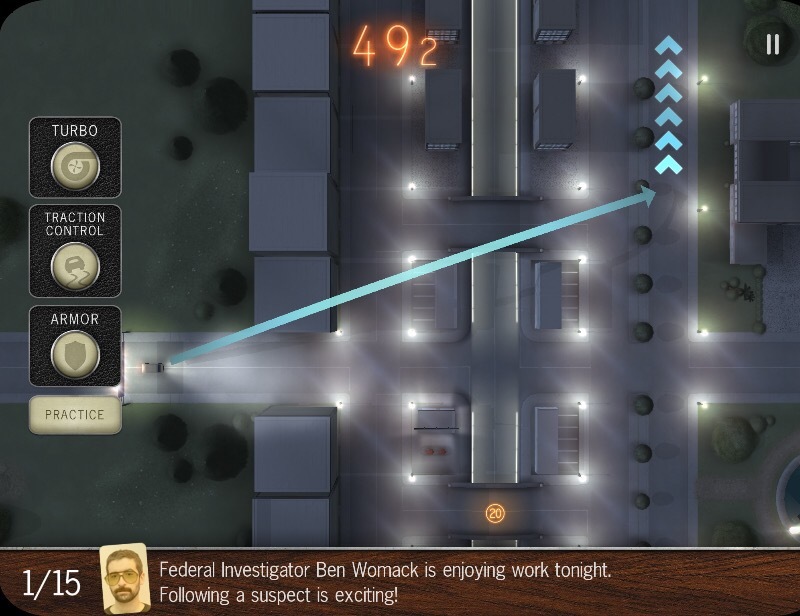 You’re playing the long game in Does Not Commute, and you may find you’ll have to return to previous puzzles to allow yourself the time to finish the next ones. Fortunately, well designed power-ups you unlock along the way make the experience more forgiving and expand your options, even as the puzzles get harder. Does Not Commute can be a punishing, but satisfying game with pockets of well-written humour to ease the stress, and it’s one of my favourite titles to come along in a while. Here’s an App Store link for Does Not Commute; it’s free to download with an In-App purchase option to add checkpoints for $1.99.